I've always found myself to be up on the current trends. Needless to say, I was the fifth grader wearing all Abercrombie (back when it was cool, circa the 1990's). Some even say I got Long Island (aka my fifth grade class) hooked. I currently rock an arm party (thank you Man Repeller) and scour the ends of the earth for great Isabel Marant pieces (only to remember I can't afford them). I own several pairs of wedge sneakers, and, I rock a 3.1 Phillip Lim Pashli bag. The one thing I'm deathly afraid to try, is the drop waist dress. I know they're everywhere now, and all the skinny girls with no hips are rocking them, but I fear that my curves will get in the way of a well pulled off drop waist. However, there is one specific designer, with one specific dress, that just may change my mind... Diane Von Furstenberg. Diane Von Furstenberg's drop waist dress from Matchesfashion.com, in that gorgeous orange color, is nothing less than a piece of art. I believe that that dress could be worn by one and all (even my own curvy self). I imagine myself walking down the streets of Manhattan clad in my DVF dress with a pair of black wedges, scowling at those who walk by (model style). I can even see myself in the winter wearing the dress with a pair of tights, boots and a chunky sweater. DVF's dress is the sole drop waist piece I may just have to try. When you're as good as Diane Von Furstenberg, you can convert even those most skeptical out there. That's the beauty of talent. Love this dress! I saw a similar less expensive version at Joe Fresh here in NYC, I really want it! 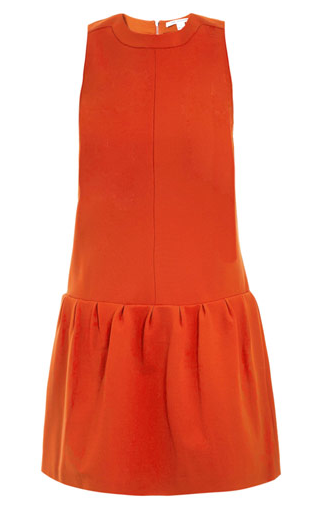 Love this bright orange dress and the dropwaist detail! Thanks for dropping by my site. I am now a Bloglovin' follower! Gaby. This is such a great post. I seriously love when you have something to say - because I really value your take on fashion. I, too, am incredibly skeptical of the drop waist. It does nothing for my already overly long upper half. But you're right! There is SOMETHING about this dress that sort of balances out the awkward proportions of the drop silhouette. I think it may be due, in part, to the chunkier collar, or maybe the line of symmetry down the middle that sort of draws the eye away from the length and towards the center. Whatever it is, I can beyondbeyond definitely see you in this. You're right, black wedges would be killer, and this collar would look fantastic with your hair. Pleaseeee get it. Please please please. For the sake of all of us who get our thrills in life vicariously through others. Beautiful dress, I love the colour! that color would look amazing on you! as a fellow fearer of the drop waist i can't wait to see how it goes!